This is a list of music and dances used in the production. Caroline Evans was extremely kind and helpful in sharing her research of the tunes used. Father, Father Build me a Boat - Emma and Frank's pianoforte duet. Bonny Breast Knot (music) (as above) From Eric Foxley's Traditional English Dance Music Database, used with permission. Donwell Ensemble (Dance Descriptions) - Also, see the "Haste to the Wedding" information below! Final dance at Donwell - Combination of "Mr. Isaac's Maggot" and "Step Stately"
"...they are dancing to the tune "Haste to the Wedding." This is more popular as a Scottish Country Dance, but I have danced the English version at least once, and I thought it contained the promenade which is in the film. However, watching the film 30 times or so, may have affected my memory! My husband and I both searched the web (separately!) and we weren't able to find the instructions we remembered. CDSS does have books which have a dance description, but, of course, they want you to buy the book, so they haven't given out the description. However, I did find the music:(Just click no to installing new fonts and the music comes right up: http://www.linkclub.or.jp/~jewellot/ire/gakufu/hastwedding.html - Haste to the Wedding. Also this English version, which isn't the same as the film: http://members.aol.com/erogers358/inst.htm#dance62. And the Scottish version is here: (scroll down to find it) http://sprott.physics.wisc.edu/mscd/Dec98.htm - Almost Winter Dance Party 1998 - Madison Scottish Country Dancers." 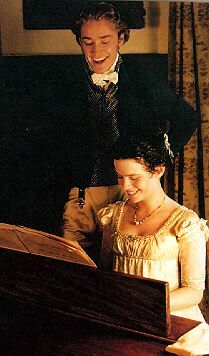 "In Emma especially, notions of couplehood are often manifested on the dance floor, successfully and not so successfully - take Frank and Emma, for example, who seem to be "made to stand up together..." and also Harriet's sudden crush on Mr. Knightley, her rescuer at the Crown ball." 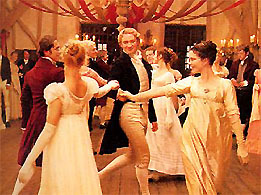 For an interesting perspective on the dancing in Emma s 2 and 3, visit this section at TheLoiterer.org. English Folk Dance and Song Society/Cecil Sharp House - home of the English Folk Dance and Song Society. They've got a great library of dances and tunes for the serious dancer or musician. The American Country Dance and Song Society has a comprehensive online catalog.